While a new trend is taking place among pet owners to allow their pets to forego using collars and ID tags because they are microchipped, this could become problematic if you have an emergency. If separated during an emergency, you have a greater chance of being reunited with your pet/s if they are wearing ID tags with up-to-date information such as your phone number, and the phone number of a pet sitter or friend who knows your pet. *Be sure that your notes about your pet/s includes their feeding and medication routine and any behavior issues. Most pet owners are not aware that even though they need to evacuate, their pets cannot come with them to a local or state run or Red Cross disaster shelter due to health and safety regulations. Preparing a list of pet friendly hotels, motels and inns as well as veterinarians and boarding facilities ahead of time will increase the chances of you finding a safe place for your pet. Don’t forget to ask how many pets you can bring and what size they can be. Be sure to follow instructions during a disaster. Ignoring weather advisories or instructions from law enforcement or other first responders can put you and your pet/s in harm’s way. Having an emergency radio (often given free by local utility companies) can be helpful to keep abreast of changing conditions. Keep your phones charged in case the power goes out and you need to use your phone. 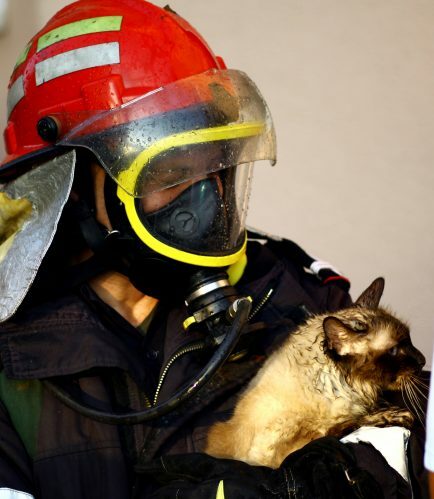 Leave a rescue sticker in the front window of your home to let rescue workers know there are pets inside. If you need to evacuate, write ‘EVACUATED’ across your stickers so rescue workers try to find your pet.